Gift certificates can come in handy in a variety of situations, and you want to have the help that is needed to create one that is just right for you and your needs. 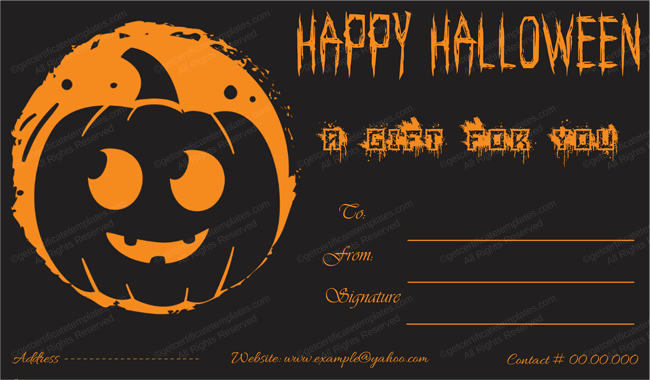 When Halloween is coming up, you want to be able to create a gift certificate that is perfect for that holiday. You will find that this blank Halloween gift certificate will help you with that. This template features the image of a bat, and it is something that has a fun look to it. This template includes space for all kinds of relevant information, allowing you to create something that makes sense and that will be understood. You will find that this blank Halloween gift certificate has a fun look to it and yet that it also includes the space that you need to make things formal and to help everyone understand what it is all about. © 2014-2018 Copyright. Get Certificate Template. Get Certificate Templates is a place of professionally designed premium and free certificate templates for Microsoft® Word.